First Line: Dear Madam, I hope you won't think me forward, but I wanted to write to express my admiration for your book, From an Eagle's Aerie. In March of 1912, twenty-four-year-old poet Elspeth Dunn receives a fan letter from college student David Graham, a student at the University of Illinois who's a world away from the home Elspeth has never left, Scotland's Isle of Skye. A correspondence is started which gradually moves from friendship to love. Then World War I intervenes, and David volunteers as an ambulance driver on the Western Front. All Elspeth can do is wait for him on Skye and hope that he'll survive. In June of 1940, Elspeth's daughter Margaret has been busy relocating children away from cities like Edinburgh that are being bombed by the Germans. When Elspeth learns Margaret has fallen in love with an RAF pilot, she tries to warn her daughter against wartime romance, but she knows her words have fallen on deaf ears. After a bomb rocks Elspeth's house, she disappears, leaving behind a single letter as a clue to her whereabouts. When Margaret sets out to find her mother, she's also starting out on a journey to uncover what happened to her family in the past. I've always been a fan of books that have more than one timeline if they're well-written, and Letters from Skye certainly is. These timelines involving the world wars compliment each other perfectly, and Brockmole's research adds period detail that brings the stories to life. The stories unfold in a series of letters. Watching the love between Elspeth and David blossom is a wonderful thing, and what makes this book even stronger is that readers may think they know what's going to happen, but the author doesn't always oblige. Those little surprises woven into the plot make the book even stronger and more involving. I have to be honest and admit that I have a personal reason for enjoying this book so much. When I was even younger than Elspeth, I began corresponding with a young man in England. We became friends, and that friendship turned to love. I was so in tune with Allen and the mail services that I always sensed when a letter would arrive, and heaven help anyone who got between me and the mailbox on those days. 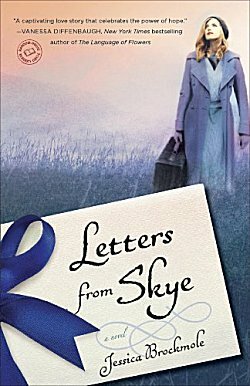 My story didn't have a happy ending, but Letters from Skye brought back the best of my memories and touched my heart profoundly. As Elspeth said to Margaret: I should've "taught you that a letter isn't always just a letter. Words on the page can drench the soul. If only you knew." I do know, and I loved this story. There's just something about those stories where you feel you have a personal connection, isn't there, Cathy? And this one does sound like a really well-written multi-layered story. Glad you enjoyed it so well. Here is your epistolary novel, Cathy! Loved reading about it and I don't think I knew this one was actually letters. I'll read it for sure. My mother was an avid letter writer - not a reader though. Maybe my comments on blogs are my 'letters' in a way. I tried so hard to get this one and failed. It sounds like such a good read. It is. I hope you have better luck in getting a copy in the future.